This response action can only be triggered by the player that controls this card, right? So when would you ever give your opponent card advantage? Maybe this is useful for removing prophecies? Maybe this is useful for removing prophecies? Some of thoses effects, I have not found their practice application till yet... they look very inconvenient to me. Mostly, you wouldn't. The main use of the card is to get intelligence about what he's going to draw - and possibly combining that with cards that can discard from the top of his deck. But, you could also use cards that can discard from his hand (maybe teaming up w/ Hastur instead of Yog) and then you might activate it. You might also have cards that require you to have fewer cards in hand than your opponent. 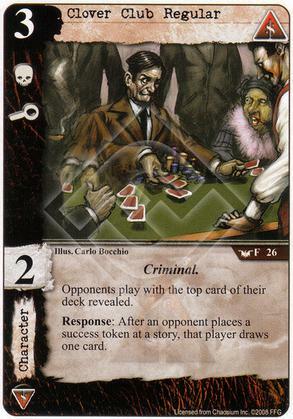 It could be used in a discard deck but Syndicate doesn't really have many such cards so you'd likely be more effective with other factions instead. It's just an option, probably something FFG put out there to see what people would make of it. Someday it might get new combos with future cards, who knows? When it came out the Prophecy-destruction angle didn't exist either. I don't have SoK, so I'm a little behind on the whole Prophecy mechanism, but could somebody explain how this card destroys a Prophecy? I know that Prophecies are supposed to be played face-up on the draw deck, but I don't see what the effect is supposed to be on subsequent draws and so forth. I could be wrong as usual but from what I gather it does almost nothing vs Prophecies. Revealing a card on top of a deck does nothing if it is already revealed as Prophecies are. Succeeding at a story with a Prophecy on top of your deck could force you to draw it, but in that case, why did you play it in the first place? If you play a Prophecy when your opponent has this character in play you should be pretty sure that it will go off before you succeed at a story. If your opponent has a face-up prophecy card and is forced to draw it, it can no longer trigger. Yes, it's definitely situational and some Prophecies will either have already triggered before your trigger can go off OR will have passed their opportunity to go off and in both of these situations it's not useful to have them draw a card. That's why I'm saying that the intelligence is the main point and making them draw is a once-in-a-blue-moon sort of thing, at least today. I think my usual opponent has been abusing his prophecies by drawing from under them. So when you play a prophecy, it's effectively wagering your next draw that you'll be able to trigger the prophecy and get its effect, eh? If it doesn't happen by your next turn, you'll ordinarily have to draw back the face-up prophecy, leaving you right where you started? That is correct Carthoris, the Prophecies have a built in drawback that if you don't get their effect before your next draw you will draw it back into your hand. Now that I understand prophecies better, they seem to have some serious weaknesses. I would delight in using Disturbing Auction (or maybe Artists Colony) against an opponent with a prophecy exposed. They're supposed to have weaknesses though. Generally you're getting a more powerful event than what you'd normally get for that cost in return for it being conditional whether or not it goes off. Also, your opponent knows about them and you have less control over their timing. It's up to the player to decide whether the tradeoffs are worth it or not but often they are if your deck's strategy is such that the condition is easy to trigger. Personally I really like the idea and I hope they put out a lot more Prophecies in the future. (Continuing OT prophecy chat) Sure, I understand that these are weaknesses by design. I just hadn't seen them before. My only real objection to the prophecies in SoK (which they seem to have straightened out in subsequent boxes) is the unintelligible titles. I'd rather that "Hanyatl's 7:13" be the subtitle, and "She will give birth to madness..." the title. That's true. It makes the cards harder to talk about and remember I think. Judging by stats alone, this card is pretty awful and is easily outclassed by a lot of other 3-drops. Seeing your opponent's draws is nice, but isn't worth the inefficient body that goes along with it. And the ability is so niche that you'll probably never use it. Pass on this one until some super overpowered deck comes around that triggers off having no cards in hand or something. Terrible card. Any card that costs 3 and lets the opponent draw cards easily needs at least 5 icons and 5 skill, plus a beneficial keyword imo. Best case scenario is to win the second dragon to get 3x in play, then it can become impossible for my opponent to win without milling himself first. Unless he has an answer card in all those cards he has been drawing. Could this be a candidate for the worst combo ever when used with book of eibon? Not a card I see myself using regardless of whatever janky combos I can think of.